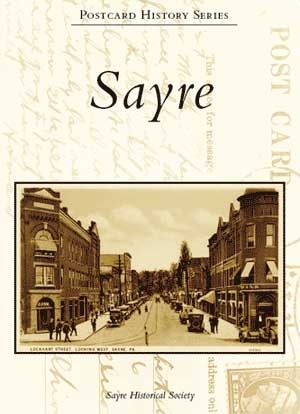 Sayre history told in 128 pages with 233 vintage postcards plus photographs. "Meticulously researched captions filled with interesting facts." Stock#0220 Price - $21.99+$1.32tax. Total #23.31 plus $5.00 shipping and handling. Also available in SAYRE during business hours at the Sayre Public Library, 122 S. Elmer Ave., Carl's Newsstand, 138 Desmond St. AND Horn's True Value, 503 N. Keystone Ave.